A high-speed railway opened Thursday in Hainan, China’s southernmost province, greatly cutting travel time along the island’s eastern coast. 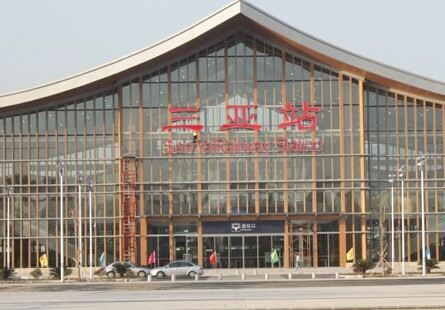 The Donghuan (East Ring) Railway is 308 kilometers long, links up the cities of Haikou, the provincial capital, and Sanya, as well as a number of popular tourist destinations along the way. The trip between the two cities takes about 82 minutes at a speed of 250 km per hour, half the time it takes by road. It took workers more than three years to complete the railway, which cost 20.2 billion yuan (3 billion U.S. dollars). The railway passes through areas where most of Hainan’s scenic sites are located and which receive 90 percent of the island’s incoming tourists. The railway will greatly improve Hainan’s transportation capacity, promote urbanization and boost economic development, Luo Baoming, governor of Hainan, said at the railway’s opening ceremony. Also on Thursday, a ceremony was held to start the construction of another high-speed railway on the western coast of Hainan. The 345-km West Ring route is planned to also link Haikou and Sanya with a designed speed of up to 250 km per hour. The 26.78-billion-yuan project is expected to be completed in four years, and will form a rail circuit around the island together with the newly opened line.